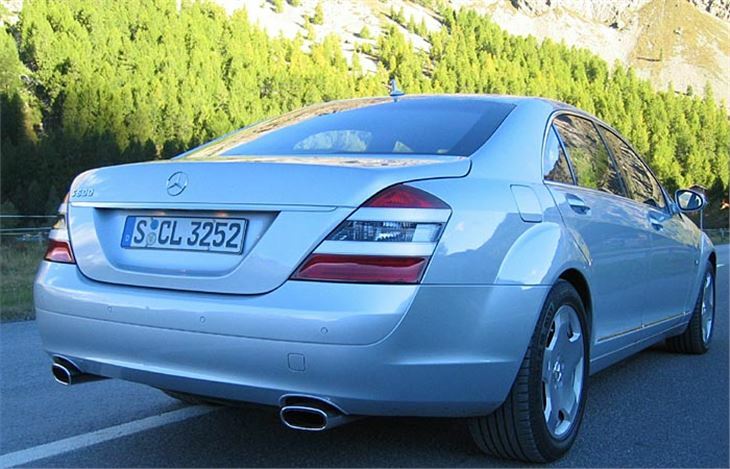 Six years into its model life, we have a new Mercedes S-Class. 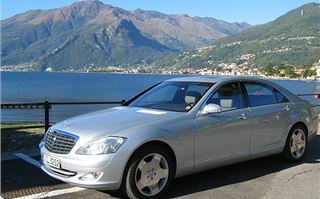 Though it will be more like seven years before the new W221 reaches Britain in March 2006. 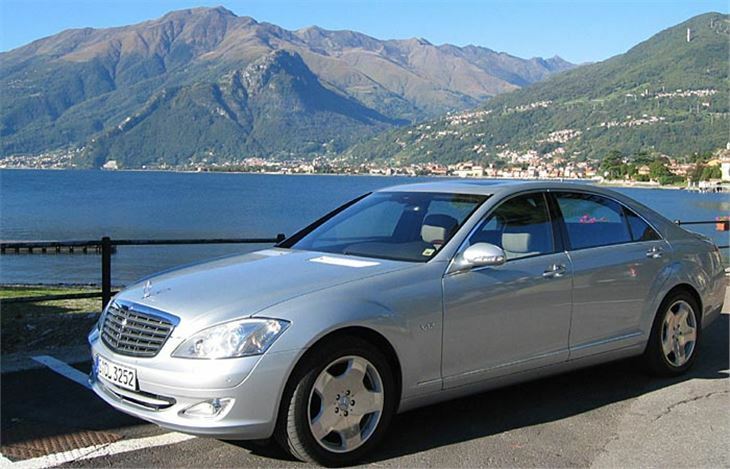 The current W220 S-Class is to most eyes a beautiful looking car, the svelte lines of which belie its bulk. It has been a great favourite, selling 17,852 in the UK alone, the most common car parked kerbside outside the embassies and consulates of Kensington. Now you can pick one up used for around £12,000 they are even gracing the station taxi ranks of posh suburbs like Walton-on-Thames. I liked the car very much. Always felt at ease behind the wheel of a big Benz, especially the twin-turbo S600 and the LHD only S500 4-Matic that cornered in the wet as you might imagine a Mitsubishi Evo limousine. But the car had its critics. 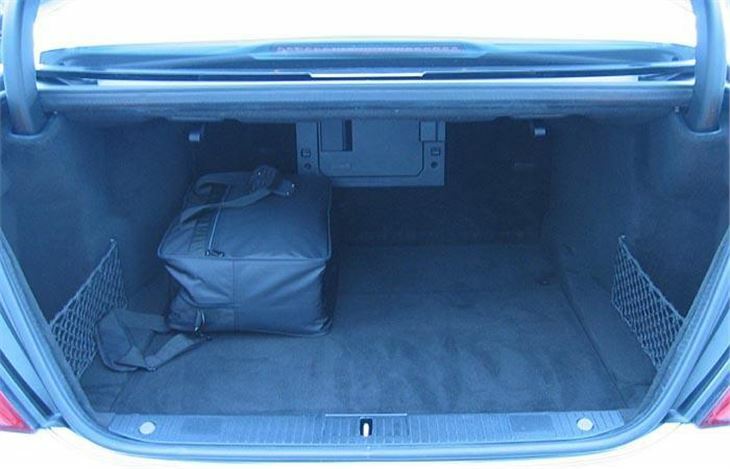 Not enough boot room was one complaint. Quite a lot of niggles. And a perception that quality of build and materials used was progressively downgraded. Add to that extremely high servicing and repair costs and there had to be another reason why 70% - 90% of owners stayed loyal to the model rather than desert to Audi, BMW, Lexus or Jaguar. The looks? The 3 pointed star? The way the car drives? What it says about them? Make your up own mind if you aren’t already an S-Class owner and know. Behind its voluptuous Mazda RX8-like wheel-arches, the new S-Class offers more interior space than its predecessor and a bigger boot. 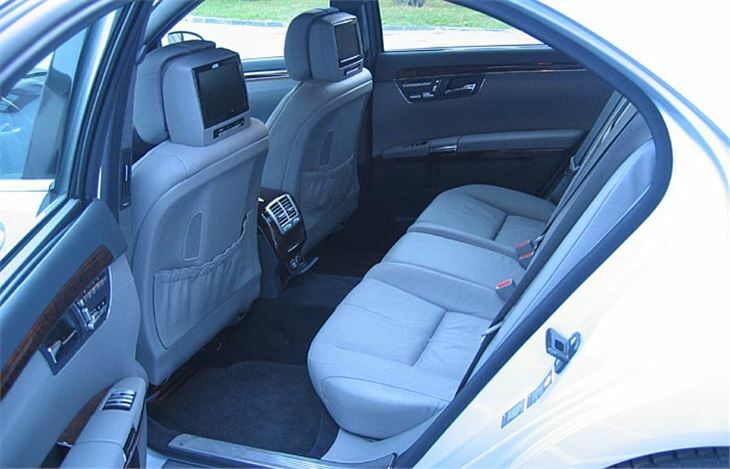 Though if you covet rear legroom I’d better advise you to cough up the extra £4,000 for the five inches longer LWB (£800 an inch). The interior is a mix of familiar and unfamiliar. You still get the seat-shaped seat adjustment buttons, and other buttons for essential functions. But for more complex adjustments you have to go into the new hard-drive backed Command system, which is a bit like BMW’s I-Drive, though easier to acclimatise to. A slight culture shock is the absence of a central quadrant for the transmission selector. Instead you get a fat ‘Direct Shift’ column stalk like the new ML’s by which you select ‘D’, ‘R’, or ‘P’ and which is so logical you wonder why they didn’t do it before. You can choose Comfort, Sport or Manual gearchange settings (which also make appropriate changes to the suspension), and manually change up or down by means of rocker buttons behind the steering wheel. Unlike the ML where both buttons change up and down, on the S Class, left changes down, right changes up. You still get the World’s simplest to use cruise-control selector with speed-limiter. And, as an option, a new version of Distronic braking combining wide and narrow radar beams which does the braking for you in traffic and reduces the chance or rear-ending someone by 75%. It required a change in EU law, as did the very sensible flashing red LED brakelights. Yet another optional innovation is Night View Assist, which uses projected infra-red beams (undetectable to oncoming drivers) and an infra-red camera to display a view of the road ahead up to 3 times further than the headlights onto a screen that replaces the speedometer. (Speed is then shown by a ribbon display.) This really is a good thing because it avoids dazzling oncoming drivers with powerful Xenon headlights. PRE-SAFE, which prepares you and the car for a crash if it judges one to be inevitable, is standard on all new S Class. A more amusing accessory is the ‘dynamic multicontour seat’, which, besides allowing twelve-way adjustment allows you to select four different types of massage that feel like someone walking up and down your back. On to driving impressions, we tried an S500 first. It proves to be a serenely capable car, very quiet and unruffled at normal speeds and a superb motorway cruiser, as you would expect. 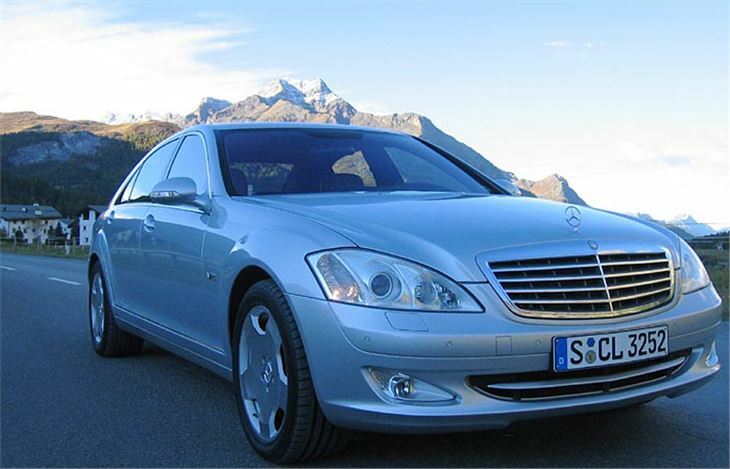 All S-Class apart from the S-600 are fitted with Mercedes relatively new 7G-TRONIC automatic transmission that gives you seven ratios to play with on the buttons if you want to and also greatly lessens the undesirable trait of autoboxes to change down at the wrong part of the corner. But it’s not infallible, on the S500, at least. Its 388bhp and 530NM torque can still come in with a thump on mountain roads when you’re trying to press on. Apparently, this is much less of a problem with the S350, but made me wonder why the S320CDI, the most popular engine in the S-Class, was not available to drive at the launch. 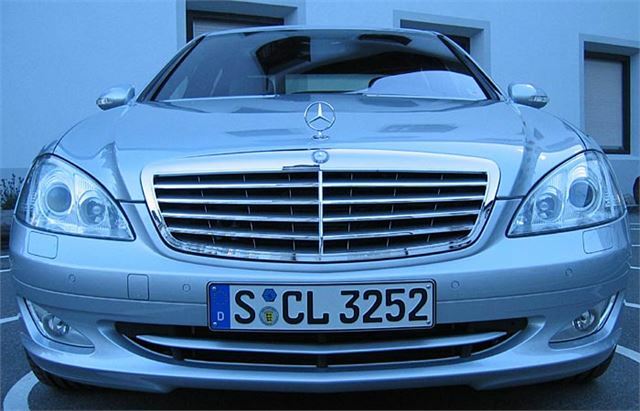 For the not inconsiderable sum of £73,770, the S500L is a good car, but it isn’t a great car. That accolade goes to the S600, a 2,690kg, 517bhp leviathan that takes off from zero to 60mph in 4.4 seconds, about the same as a Mitsubishi Evo IX FQ340. It’s a luxurious limousine when you want it to be. And a snarling tiger of a car when you need to press on. The speed at which it catapults past slower traffic (including slower driven S600s) is simply astonishing. At one point I had accelerated to 200kph, with an open, clear-sited bend ahead only to exit the bend at 220kph. It’s simply staggeringly quick. Yet when you’re stuck in traffic, and I mean really stuck, it’s as docile as a pussycat. Just press the P-for-park button and you’re not even blinding the guy behind with your blinking brakelights. Then when the van in front starts to move again, touch the brake pedal, slip it into ‘D’ and off you glide again. It’s a very wide car, and part of the test run was via narrow streets with oncoming trucks, but the front-side park distance control makes sure you don’t collide with any walls or parked vehicles. And even if a kerb does suddenly leap out at you, as one did to me following traffic in a badly-lit tunnel, the 19” tyres sit sufficiently proud of the alloys for no damage to ensue. So, if you have £100,000 burning a hole in your bank balance, and perhaps another £10,000 or so for the more desirable accessories (almost Bentley Continental money), the S600 is still a contender for ‘Best Car in the World’. Mercedes claims to have addressed its quality problems by the use of extremely high quality components, plastics, materials, skins, and woods. And also by thorough testing of the new model during which the cars were driven a total of 8,000,000 kilometres by a total of 2,000 test drivers, including members of the public. Instead of relying on them to describe faults, the cars were fitted with ‘black boxes’, like aircraft flight recorders, so any blip could be pinpointed and the relevant electronics stabilised. Also, after some management changes, cost-cutting is no longer king at Mercedes and quality throughout the company is now back where it should be. The C Class has recently been nominated top of the most recent American J.D. Power Customer Satisfaction Survey, beating even Lexus. Has it all worked? From the cars I drove I’d say yes. The materials do look and feel extremely high rent, especially the dark grey Alcantara headlining. I searched hard for bad welds and screw-heads, but found none. The door-shuts are particularly smooth. All I could see was a crude bit of crimping at the inside bottom front edge of the front doors. Be one of the first to buy a new S-Class and you won’t be a quality control guinea pig. But we won’t really know for sure how reliable they will prove to be until the cars have been out there on the roads for a year or so. Back in the UK 4 months later I got a chance to drive the S350, S320CDI and actually check out Night Vision Assist at night. Night Vision is a bit eerie. You see the road ahead in a kind of Blair Witch Project black and white on a screen in front of you where the speedometer would usually be. And it does pick out people, dogs and anything else far better than headlights do. But unless you learned to drive on ‘Grand Theft Auto’, you cannot actually drive by it or you will hit every kerb in Oxfordshire. So you have to treat it like a mirror or a satnav, or a speedometer for that matter, constantly looking from it to the real road and back again. The S350 is the weakest S Class but still a smooth and efficient limo, best driven like a limo, and will probably have a fuel consumption benefit against the mush more satisfying S500 when driven in town. But the S Class most people will buy is the S320CDI, seemingly at a power disadvantage with only 235bhp, yet also with a torque advantage of no less than 540Nm. With only 4,500rpm to play with you can’t use the gears as long as other S Class. 2nd, for example, only takes you to 49mph. But the torque makes up for it. And though the S320CDI is bigger than other Mercedes sharing the same engine, it actually handles better than the E-Class and CLS. So a short wheelbase S320CDI with a few extras does the job for the right side of £60,000. 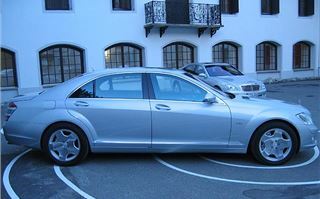 And is the slowest depreciating S Class. Which is why it will remain the best seller.